Todd Bolen has been producing high quality resources for Bible teachers for many years on his website Bible Places.com. I first became aware of Bolens’s Pictorial Library of Biblical Lands at an ETS in 2003. At the time this was eight CDs or one DVD of high quality photographs of Israel and Asia Minor. I have used these photographs in virtually every class I teach to add some graphics to an otherwise dull PowerPoint presentation. I added the American Colony and Eric Matson collections in 2009, and there are several other historical sets available on Bolen’s site. This new resource from BiblePlaces.com is something of a mash-up of all of Bolen’s previous collections plus a great deal more. Each volume of the Photo Companion to the Bible covers a Gospel chapter by chapter as a PowerPoint collection. Photographs are arranged by verse, with several slides per verse in many cases. For example, for Mark there are 16 PowerPoint files, each set has more than 100 images. Some readers might wonder if it is worth purchasing these DVDs since they are used to using Google Image Search to find pictures for their lectures. First, these photographs often do not appear on the web. For most of the collection, BiblePlaces.com has taken these photographs themselves and they own the copyright. These are not snapshots from someone’s Holy Land Tour taken with their iPhone. I have noticed the photographs were often taken when there are few tourists in the way. The Photo Companion to the Bible allows for legal images which can be edited for your own needs. (Here is a list of contributors for proper attribution.) I have seen Bolen’s photographs in many books from major publishers, which speaks to the quality of this resource. There are several types of photographs are in each collection. For most passages, slides contain geographical photographs from Bolen’s earlier collections and new aerial photographs. Sometimes the aerial photographs are labeled pointing out key locations in the photographs. If the Old Testament is quoted, Bolen has a photograph of the relevant text in the Dead Sea Scrolls, or often a Yemenite Torah scroll photographed at The Master’s Seminary. The quoted texted is highlighted by a rectangle. Since these are PowerPoint slides, the editors provide annotations explaining the image and the location of the photograph. This is very helpful for identifying the location of museum photographs or some of the historical photographs. 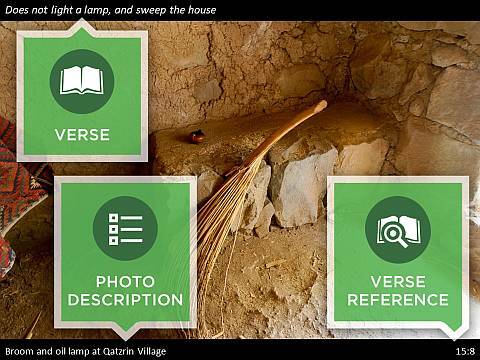 Since there are often many slides on the same topic, these descriptions are critical to the usefulness of the Photo Companion to the Bible. For example, in the Mark 16 set, there are many photographs of the Garden Tome and the Holy Sepulcher, as would be expected. But the slides include many other examples of ancient Jewish tombs. Since these are less well known, the annotations will help a teacher select the right image for their own presentation. For this review, I browsed several chapters for each Gospel, but I will comment in more detail on the file for Mark 10 (chosen more or less at random). There are 134 slides in this file, including many views of Galilee taken at different times and angles. I particular enjoy seeing the historical photographs alongside modern photos. Sometimes the location looks the same after 100 years, but in some cases you can see the impact of modern Israeli culture and (unfortunately) the tourist industry. A divorce document, in Old Assyrian, from Karum Kanesh, from the in the Ankara Museum of Anatolian Civilizations. For Mark 10:14, “Let the little children come to me,” there are slides of modern Israeli children in the Jewish quarter of the Old City and an American Colony photograph of a group of children in Kiriath Anavim in the Judean hills west of Jerusalem dated August 6, 1939. For the rich young man approaches Jesus in Mark 10:17, there is a photograph from the Istanbul Archaeological Museum of a Roman man from Magnesia on the Maeander dated to the first century AD. For the commandments in Mark 10:19, there is a photograph of the Ten Commandments from the Diaspora Yeshiva on Mount Zionl Exodus 20 from a Yemenite Torah scroll; a Sumerian tablet with the verdict concerning murder, from Girsu, 2112–2004 BC from the from Istanbul Museum of the Ancient Orient; an Egyptian warning to robbers on tomb scene of courtier Biu, 6th dynasty, ca. 2400–2250 BC; a cuneiform record of trial before king of Hazor, 18th–17th centuries BC from the Israel Museum in Jerusalem. Since the man was rich, there is a photograph of a mansion in Second Temple period Jerusalem from the Wohl Museum and several examples of wealth from other museums including the Istanbul Archaeological Museum. For the famous saying about a camel going through the eye of a needle, there are three pictures of camels and three pictures of ancient needles, and two pictures of the closed Jaffa Gate (even though this is a historic photograph from before 1920, it is not the gate Jesus would have had in mind, and there was no “needle gate” anyway). This ought to be enough to illustrate the types of things provided for each chapter of the Gospels. Occasionally I wondered at the usefulness of a particular photo, but what seems odd to me might be an excellent image for someone else. If you purchase the Photo Companion, you can download it immediately with the promise of free lifetime updates as well as get a DVD copy. and John 2), both are the full 100+ set of slides in the full product. Finally, here is a five minute video promoting the Photo Companion. 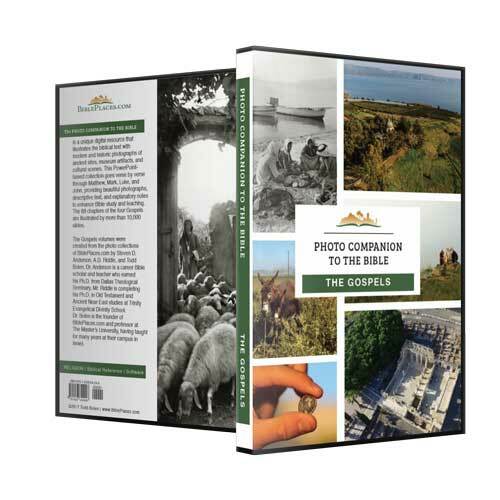 The Photo Companion to the Bible is an essential resource for anyone teaching or preaching the Gospels. This database of images will enhance your presentations and help make the world of the Gospels come alive for your students. Short of visiting Israel several times on your own, this Photo Companion will also help anyone reading through the Gospels visualize the places Jesus lived.